Mediterranean Fertility Institute operating since 1994, is now classified as one of the most successful centers in Europe and known globally, have helped to complete their family more than 5000 couples with a over all success rate of 67.6%. Always with continuous quality checks and training of our medical team and with supervision of Dr Ioannis Giakoumakis, Gynecologist/Obsterctricians and IVF Specialist, we constantly improve our success rates! We provide egg donation program with *Νo waiting list *From a group of selected donors *Having gone through strict criteria *Always maintaining their anonymity (as required by the Greek law). We deal with male infertility finding a solution to any problem in cooperation with specialized andrologysts. We assist prospective parents into their surrogacy program for a successful completion of the process, with advice and suggestions from experienced professionals. 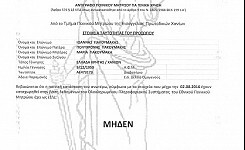 We proudly declare that Dr. Ioannis Giakoumakis has no criminal record and no patient has ever commenced against him in any form of legal process. Under no circumstances, has the doctor been involved in any judicial criminal or civil law disputes. 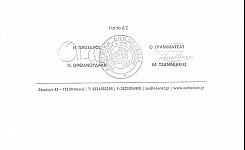 The Greek National Authority of Assisted Reproduction is a national body that introduces and controls the scientific, legal and moral frame in which all clinics and organizations related to assisted reproduction are functioning. The common frame in which the various Fertility and Assisted Reproduction Clinics practice, guarantees to women and couples that the services obtained are reliable and therefore trustworthy. 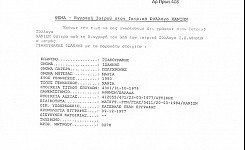 For the above reasons, the Authority was put in action again in March 2014 in order to cover the big gap that existed in controlling the area of assisted reproduction and the safe functioning of the different related clinics and organizations. According to the presidential decree, the Authority makes controls, gives suggestions, collects data and keeps records of every single case related to assisted reproduction and in general maps and mainly assures that clinics related are properly functioning. The main target of the data collection relates primarily to the protection of people by the accurate information provided referring to the percentages of successful cases. 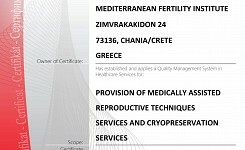 Following the audits carried out in all Assisted Reproduction Centers and Cryopreservation Banks in Greece, our center was within those that managed to pass controls and are now operating under law and under the international guidelines set by the Committee. 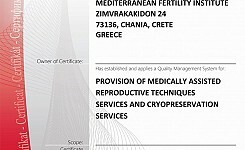 With the stamp of SWISS APPROVAL certifying the high quality of our service (ISO 9001: 2015) and operating utilizing good practices for the laboratory (BS EN 15224: 2012) we now surpass the standards set by the National Authority Medically Assisted Reproduction and are classified in one of the first Panhellenic centers that follow the instructions and rules of the most recognized standards worldwide! The family of standards for quality management systems ISO 9001 is designed to support organizations in their efforts to ensure the fulfillment of their customers' needs and other stakeholders, complying simultaneously with relevant legal and regulatory requirements. The ISO 9001, as well as all relevant Quality Management Systems, focused on continuous improvement processes to achieve the objectives related to the overall performance of the organization such as the provision of services, production lines, customer service, administration, etc. DIN EN 15224 is the European Framework specifications for the development and application in health services management systems to respond adequately to the specific needs and special circumstances of the health services (hospitals, clinics, inpatient and outpatient departments, diagnostic centers) and specialized clinics such as IVF - reproductive medicine centers (IVF units), dental centers, rehabilitation - recovery centers etc. The evaluation and certification processes of these systems should be governed by a specialized approach, substantial control procedures and identification of the deficiencies of the systems and deficits that lead to challenge for patient safety, and not simply be limited to surface inspection general data of units. Our certification body (Swiss Approval International) has been reviewed by senior and prestigious international accreditation body the UKAS (United Kingdom Accreditation Service) and so have received accreditation to be able to provide accredited ISO 9001: 2015 and the BS EN 15224 : 2012 certificates. The UKAS accreditation is valid in all countries of the European Community. Constantly trying to find ourselves as close as possible to the people who choose to make their dream of acquiring child true, we have entered into two (2) of the major sites for finding IVF centers: Egg Donation Friends (www.eggdonationfriends.com) and Where Ivf (www.whereivf.com). Evaluating the level of our services, the reviews and comments of our customers and the general image and facilities of our center, we were honored with the 'TRUSTED CLINIC' certification showing confidence in us. OVU.com is a Professional Network of Specialized Doctors and Clinics specializing in Fertility Treatment by helping your patients or loved ones. You can search through thousands of reputable and top doctors. “We are here to help you on your journey” is the message that characterizes the company.